A fourth-generation East Passyunk Avenue business continues to spread its charitable wings. Dr. Linda Portlock, CCCS deputy superintendent, eighth grade David Cramer Memorial Scholarship recipient, Kaniya Roten, and Matt Laken, COO of Cramer’s Uniforms, during the award ceremony on Friday, June 2. Cramer’s Uniforms has provided the South Philly community with a much-needed service since 1922, especially during the back-to-school season; literally helping children dress for success. Although it continues to take great pride in maintaining low prices amongst only the highest quality of uniforms, its fourth-generation heir has recently used the company’s platform to encompass a charitable endeavor. Expanding far beyond merely outfitting the next generation of graduates and professionals, the Cramer family has been awarding scholarships and recognizing scholastic hard work for decades. This year, Matthew Laken, chief operating officer and fourth-generation Cramer family descendent, found it especially fitting to name a specific memorial scholarship award after the previous CEO of their family business, David Cramer, who passed away on May 15, 2016. 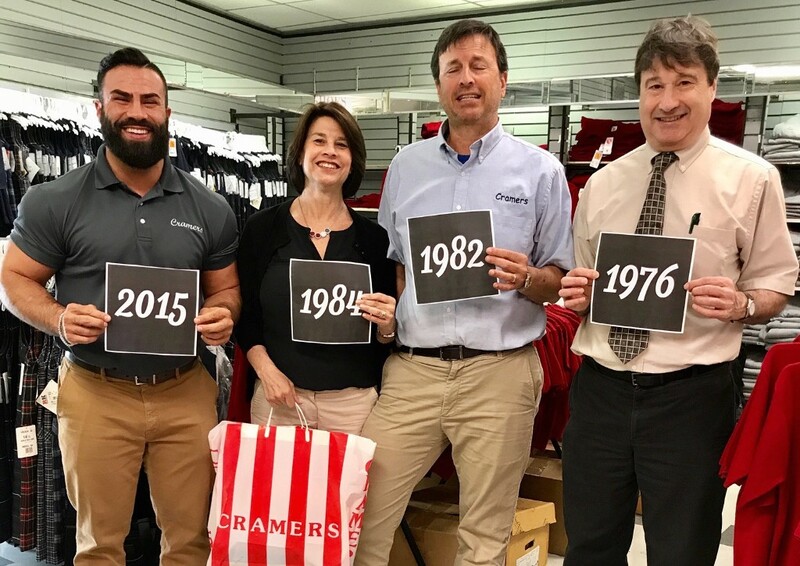 Left, Matthew Laken, Sue Ellen Laken, Robert Cramer and Warren Cramer hold up signs that display the years they each joined the Cramer’s Uniforms family business full-time. Laken spearheaded the David Cramer Memorial Scholarship as an opportunity to provide financial assistance to deserving scholars who continuously display “unconditional kindness, love and all-around joy,” while perpetuating “The Golden Rule.” In partnership with Chester Community Charter School, two students were selected by the administration for embodying these characteristics while serving as positive role models within the school’s everyday environment. 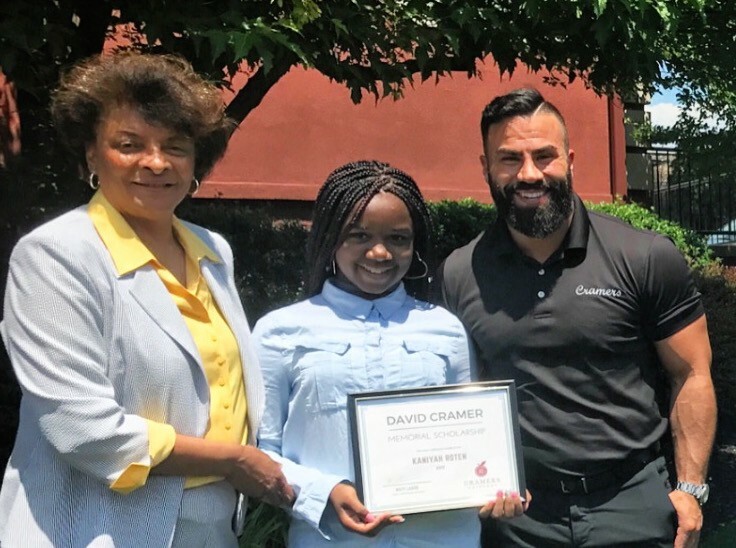 Narrowing the student body to two awardees, eighth-grade students Kaniyah Roten and Zahnayah Bivings were decided upon as the first-year recipients of the David Cramer Memorial Scholarship. They each received hundreds of dollars in financial assistance at an awards ceremony on Friday, June 2 to be used toward their future, including necessary uniforms, books, tuition, etc. While this year’s David Cramer Memorial Scholarship is the first of its kind, throughout the remainder of the year, Cramer’s Uniforms stays busy in providing other means of support. 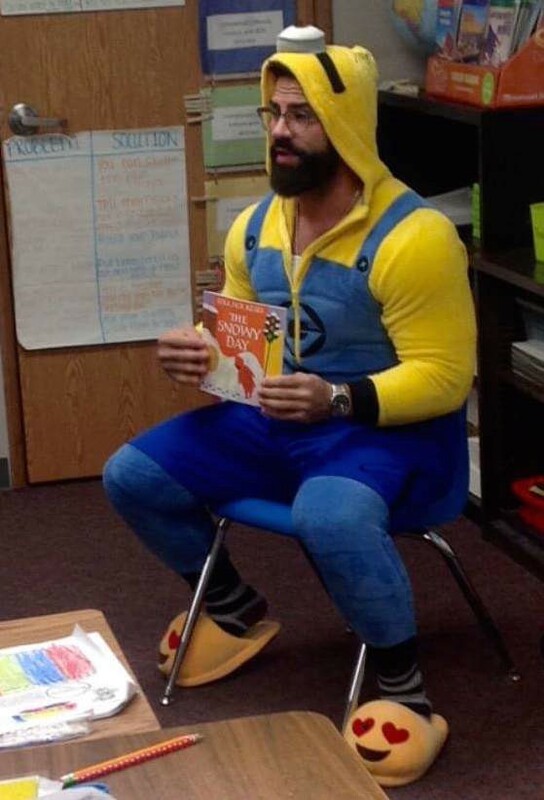 For example, the company attends fundraisers, sponsors school-run events brought to its attention, donates to needy families, and often Laken will come into the school to read to classes. Furthermore, when schools call, its employees do their best to drop whatever task at hand to ensure delivery of the best customer service possible, recognizing these partner schools are the backbone of the company. Matthew Laken, COO of Cramer’s Uniforms, reading to a collection of third graders at CCCS on Pajama Day.